Experience an unutterable thrill from a race car trip and get a guaranteed adrenaline rush, perform aerobatics maneuvers as if you are a battle-plane pilot, participate in ship battles where the bullets fly over your head and the ring of sabers and swords is heard - all these things and many others are possible in Dark Ride 5D! Dark Ride 5D is the unique attraction developed from the favorable 3D format. 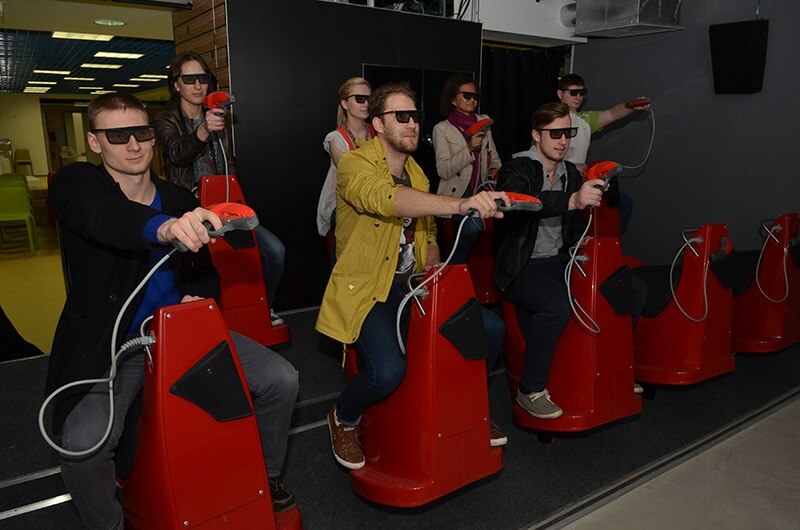 You sink into a comfortable armchair, put on special glasses and immerge yourself into the virtually word in Dark Ride 5D. The adventurous journey is accompanied with wind, water, smoke, flashes and smell effects. Besides special effects, dimensional image and vibrating moving armchairs which create the feeling of falling down in the abyss or accelerating the speed contribute to a complete perception of the virtual world as the reality. You are about to take a virtual space-trip to the depths of the Universe in Dark Ride 5D. The player is personally involved in the chases and shootouts experiencing all those feelings as if they are virtual characters. This attraction gets the players familiar with the aim of the mission which is to set free the research laboratory belonging to human-beings on the planet Vektris where Muonits, energy crystals, are being extracted. Space pirates captured the laboratory and crystals energy mine and left human-beings without energy. As military authorities of human-beings on the planet Vektris lack in combat force to fight the pirates, volunteers (players) are constantly arriving at the battle field. They are introduced to the rules of fighting the battle, trained to use weapons and sent to the center of military actions.